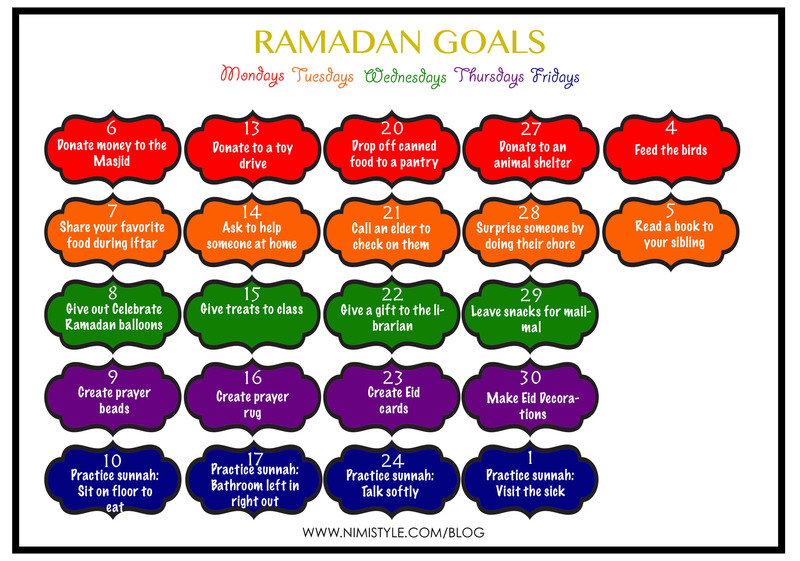 This year we came up with a list of Ramadan goals for my two older girls. Something that both an 8 and 3 year old could work on and learn from. A lot of them are repeats from the previous years, but my older one enjoyed them and they’ll be new for my middle one so i was ok with these goals be recycled. MONDAYS we will focus on charity. TUESDAYS we will dedicate to memorization of the Quran or Duas. It’ll be great motivation to catch her up on the 2 remaining Quls and teach her more duas. WEDNESDAYS will be dawah day. We will be going to various parks/classes she attends and hand out goodies with “I’m Celebrating Ramadan” tags attached. THURSDAYS we will be crafting at home. FRIDAYS we will practice a sunnah. I found this great book online with 30 Hadith for children. I’ll be using this book to discuss the sunnahs for the 9th and 16th with her.